There's lots of activity this weekend, as Makers Day is happening on Saturday. There are many events where kids can explore the world of STEAM and let their imaginations guide them! Also, don't forget about the St. Patrick's Parade in Morristown on Saturday, March 10 (a week before the actual celebrations make this a more family friendly event!). So grab the kiddos and take in a show, or create something together! 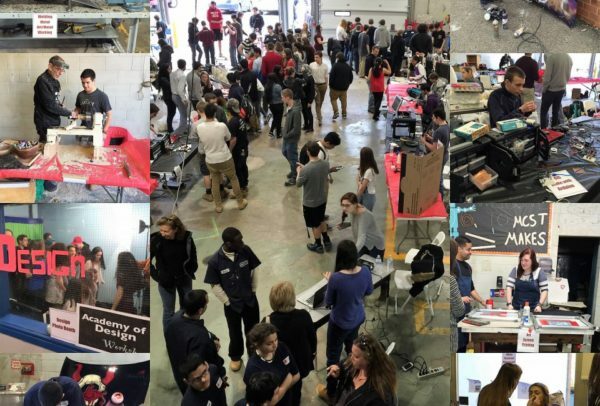 Head to the Morris County School of Technology on Saturday for exciting demonstrations focusing on the maker culture. The Maker Faire-style event will feature 3D Printing, Cosmetology, Fun with Physics, Metal Sculpting, Robotics, Screen Printing, Video Game Development, Student Food Trucks, and much more. NJ Makers Day is designed to be a statewide event that celebrates, promotes, and in many cases, may introduce maker culture, as well as the values associated with making, tinkering and STEM-based learning. Registration for this free event is encouraged. Raise a timber-framed house at METC. Professional Cabinetmake Tyler Merson will lead visitors in building a scale-model East Jersey Cottage. Treat the whole family to an afternoon of storytelling and music with Fishin' with Ish and Other Nonsense, featuring Ken Galipeau, Contagious energy, sincere enthusiasm, and an eclectic repertoire make Ken Galipeau a singer and storyteller unlike any other. Drawing from both time-tested tradition and his own experiences, Ken’s songs will touch your heart and tease your soul. No matter whether he’s playing for world-weary adults or excited kids, Ken knows just what songs are right for his audience. Known for him spell-binding talent and winning warmth, Ken will take you on a wild and wonderful adventure of story, music and imagination. Also featured are New Jersey storytellers Judy England-McCarthy and Linda Howe, both using audience participation to bring stories to life. Renew your rainbow connection with the classic Jim Henson film at this family-friendly, interactive experience. The Sing Along crew brings elements of the film to life via puppetry and more, while children and adults are urged to participate in a variety of fun ways for Muppet fans old and new. This relaxed performance will have lights up, modified sound, a quiet room, and the ability to get out of your seat, so children with special needs may share in this family experience.